How can current aging-in-place efforts by public health departments, age-friendly communities, and villages for older adults be harnessed to strengthen the disaster resilience of older adults? Which existing programs or new collaborations among public health departments, age-friendly communities, and villages for older adults show promise for improving disaster resilience for older populations? 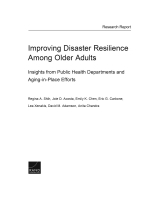 This report uses interview data collected from public health departments and aging-in-place efforts — specifically, from coordinators of age-friendly communities and village executive directors — to explore how current aging-in-place efforts can be harnessed to strengthen the disaster resilience of older adults and which existing programs or new collaborations among public health departments and these organizations show promise for improving disaster resilience for older populations. Interviews with stakeholders revealed that most age-friendly communities and senior villages did not place a high priority on promoting disaster preparedness. While most public health departments conducted or took the lead on disaster preparedness and resilience activities, they were not necessarily tailored to older adults. Aligning and extending public health departments' current preparedness activities to include aging-in-place efforts and greater tailoring of existing preparedness activities to the needs of older adults could significantly improve their disaster preparedness and resilience. For jurisdictions that do not have an existing aging-in-place effort, public health departments can help initiate those efforts and work to incorporate preparedness activities at the outset of newly developing aging-in-place efforts. Interviews with stakeholders revealed that most age-friendly communities (AFCs) and villages did not place a high priority on promoting disaster preparedness. While most public health departments did engage in disaster preparedness and resilience activities, they were not necessarily tailored to older adults. AFCs and village interviewees cited older adults' challenges with communication and low prioritization of the need to plan for disasters. These organizations also acknowledged their limited awareness of disaster preparedness and lack of demand from their constituents to provide services to help their communities be better prepared. The work of public health departments and aging-in-place efforts is complementary. Improving the everyday engagement of older adults with family, friends, neighbors, and trusted institutions supports other organizations' and agencies' preparedness work by strengthening informal ties and building information networks. 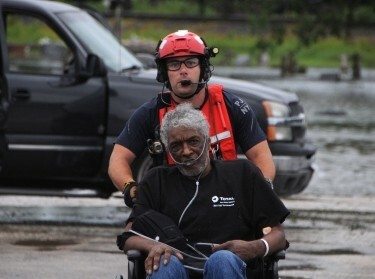 Likewise, the work of helping older adults become more resilient to disasters provides an opportunity for older adults to engage with others and learn skills needed to remain in their homes and communities as they age. Current aging-in-place efforts can be harnessed to strengthen the disaster resilience of older adults. 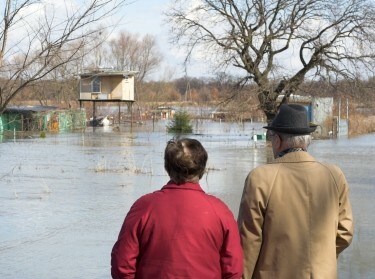 Existing programs and new collaborations between public health departments and these organizations show promise for improving disaster resilience for older populations. Aligning and extending public health departments' current preparedness activities to include aging-in-place efforts and greater tailoring of existing preparedness activities to the needs of older adults could significantly improve their disaster preparedness and resilience. For jurisdictions that do not have an existing aging-in-place effort, public health departments can help initiate those efforts and work to incorporate preparedness activities at the outset of newly developing aging-in-place efforts. Joie D. Acosta, Regina A. Shih @ReginaShih, et al. This research was sponsored by the Centers for Disease Control and Prevention and was conducted by RAND Health. Shih, Regina A., Joie D. Acosta, Emily K. Chen, Eric G. Carbone, Lea Xenakis, David M. Adamson, and Anita Chandra, Improving Disaster Resilience Among Older Adults: Insights from Public Health Departments and Aging-in-Place Efforts. Santa Monica, CA: RAND Corporation, 2018. https://www.rand.org/pubs/research_reports/RR2313.html.